HD12 is the company’s second purpose-built 4K outside broadcast vehicle and the first to launch from the active Victorian market. It is equal in size, technical capabilities and work environment to HD11, which NEP launched in August of last year. HD11 and HD12 are unmatched by any other mobile production facilities in Australia. They are equipped with Sony’s HDC4300 4K and high-speed camera technology, bringing to 50 the number of these camera units in NEP’s fleet. HD12 will immediately was on work for last weekend’s AFL coverage for the Seven Network and FOX SPORTS. Mediatec Broadcast Group, headquartered in Stockholm, Sweden, announced that it has changed its company name to NEP. The change is effective immediately and includes all affiliated companies in Belgium, Finland, Germany, Norway, Sweden and Switzerland. The group will operate as a part of the NEP Worldwide Network and the affiliated companies are named NEP Belgium, NEP Finland, NEP Germany, NEP Norway, NEP Sweden and NEP Switzerland. NEP Worldwide Network is owned by NEP Group, headquartered in Pittsburgh, USA, a leading worldwide provider of outsourced production solutions offering technical services for outside broadcasting, studio production, host broadcasting, post production, smart asset/media management, multi-screen delivery and end-to-end OTT solutions. NEP Germany and NEP Belgium, formerly known as MPP Mediatec Broadcast and Outside Broadcast respectively, have each invested in five new XT3 live production servers from EVS, the leader in live video technology for broadcast and new media productions. These ten servers all feature the new Channel MAX configuration and allows the two companies – part of the NEP Worldwide Network – to extend each XT3 to 12 channels and beyond.NEP Germany, which was part of the Mediatec Group recently acquired by the NEP Worldwide Network, offers innovative solutions for the production of broadcast operations across sports, entertainment and music events. The XT3 Channel MAX servers were installed across the service providers’ fleets at the beginning of 2016 and will be used throughout multiple upcoming productions. From the morning of the 22nd March, the day of the terrorist attacks at Zaventem Airport and Maelbeek underground station, Overon has provided comprehensive broadcast coverage of the breaking events from a host of key points in the Belgian capital. The first round of coverage was provided by equipment and staff from Overon’s base in Brussels and which kicked off barely two hours after the first bomb attack at the airport. Extra equipment was flown in from bases in Paris, Nice, Warsaw, Barcelona and Bilbao providing a total of 7 DSNG’s working simultaneously with 15 stand-up positions in place. Overon provided news coverage which included more than 350 live link-ups. 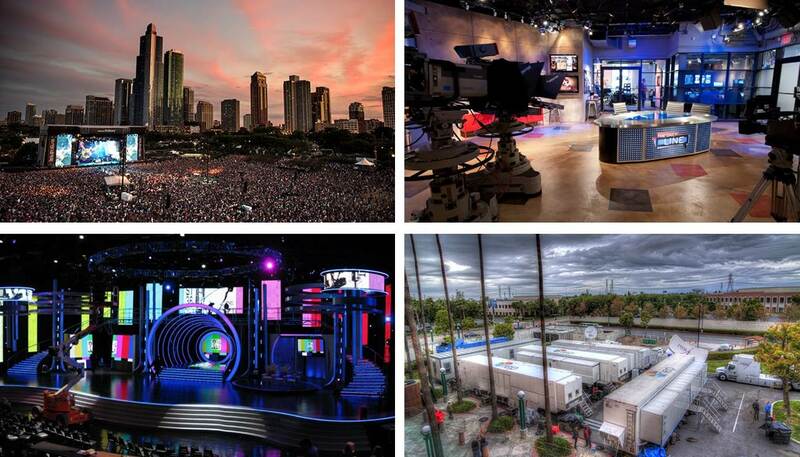 A 26-strong team supplied more than 40 TV stations both national and international. The impact of the internet on the music industry has led to artists producing even more visual content; not only to complement their audio compositions, as traditional music videos have done, but also to connect more closely with fans and allow them to share in the production process. Live studio sessions, which previously remained behind the scenes, are now taking center stage for many artists. Songwriter and music producer Boe Larsen recognized this trend and decided to integrate a live multicam workflow, featuring Blackmagic Design infrastructure, into his recording facility in Copenhagen, MillFactory Studios, which are based at the former legendary Werner Recording Studios in the city. In late 2011 Broadcast Solutions implemented a complete TV playout center for NEP (mediatec) Broadcast AS in Oslo/Norway. The studio consists of a master control room and a central control room with 52 decoders, 28 encoders, 16 up/down/cross converters, 16 channel Dolby E, one 288x576 Snell Cygnus video router and one 576x576 Snell Cygnus video router. Four stations are handled with the Probel Morpheus automation system and seven EVS servers: the “Rikstoto” sports channel and three Viasat channels. Two production studios, each with six cameras, are connected to the main control room, an external connection to an OB truck is also provided. HBS – a subsidiary of Infront Sports & Media, and as such part of Wanda Sports Holding - will provide logistics, project management and editorial services to assist all key parties in the delivery of a successful tournament. Furthermore, the company will be responsible for the production and the delivery of a daily 24-minute highlights programme, in addition to the footage for the high-quality competition review show – “El Centenario” – which will recap the most memorable moments of the event and will air the day after the final, to be played on 26 June at MetLife Stadium in the New York metropolitan area. The 2016 Copa America Centenario is the historic centennial edition of Copa America - the South American championship - and will be staged outside of South America for the first time. The historic tournament features six teams from CONCACAF and all 10 teams from CONMEBOL. For the third time in the history of the game, France, the French Football Federation and French football as a whole are preparing to host the finals of the UEFA European Football Championship – known to most as UEFA EURO 2016. And perhaps returning to France is appropriate, as the whole idea of the Championships was the brainchild of Frenchman, Henri Delaunay. He became the first general secretary of UEFA and the trophy that the tournament winners receive is named in his honour. The original line-up for the EURO 2016 qualifying rounds saw a record number of 54 teams take part. Those qualifiers produced the 24 teams that will take part in the finals. This increase from 16 finalists in previous tournaments means that many countries are now appearing at this stage of the Championships for the first time. Host broadcaster rbb (Rundfunk Berlin Brandenburg) had developed an 18-camera plan for the world feed and had hired production company TopVision to produce the two days event with its HD2. Highlight of the production was a Sony HDC-4300 housed in a large lense adaptor with a Canon Digisuper 95 in combination with an EVS XT3 running already the ChannelMAX software which supports 8x SuperMotion. The Sony/EVS combination delivered stunning and flickerfree images and managed the combination of daylight and artifical light in the Sportforum Hohenschönhausen without any problem. NEP Sweden (formerly Mediatec Broadcast) and Rail & Tracking Systems (RTS) have purchased NEWTON camera heads from Intuitive Aerial. The gyro-stabilized heads will be used immediately for the live broadcast of the Eurovision Song Contest 2016. For the first time, TV broadcasters have a cost-efficient, lightweight, stabilized camera head to capture dynamic action with precision. The NEWTON stabilizes cameras to capture steady shots from compact rigs with box-type UHD cinema and TV cameras. The 15-lb unit can be mounted on 1D/2D/3D wire-cam systems, cranes, dollies, motorcycles, jet skis and other vehicles, and any compact moving rig where weight and visual footprint need to be minimized. Covering a period of about four weeks, and mentored by leading industry designer Dave ‘Biccie’ Lee, the programme culminated with the design of a real lighting rig programmed and operated by the students - Will Steggles, Sam Woolass, Stacey Sandford, Andrew Budge, Matt Bevan and Mitch Andrews - for a ticketed concert at the college’s Rose Theatre. The Concert Lighting Project idea was initiated by the college’s Programme Director for Lighting Design, Hansjorg Schmidt a couple of years ago, and has been a great success in increasing knowledge and awareness of the real challenges in lighting a show. This year Robe made 36 fixtures available – a mix of LEDWash 600s, 600E Spots, LEDBeam 100s, CycFX 4s and MMX Blades, Spots and WashBeams. Rapper Pitbull performed his latest single "Bad Man" on NBC's "Tonight Show Starring Jimmy Fallon" during Grammy week filming in Los Angeles in February and added visual punch and energy to the performance using Elation Professional’s new ACL 360 Roller™ effect lights. After performing and winning at The Grammy’s the night before, Pitbull was joined on the Tonight Show stage by Robin Thicke, Joe Perry and Travis Barker. “Pitbull songs need a big look to support the energy he brings to the stage and we needed a bright and quick fixture for the song Bad Man,” said Remotes Lighting Designer for the Tonight Show. A new feature of this year’s Prolight + Sound is the way each day of the show takes a key thematic area, which is featured across both the Prolight + Sound exhibition and the Eventplaza Conference. On Tuesday the focus is on professional qualification and encouraging young people into the industry, while Wednesday concentrates on safety at events together with legal framework conditions, when the successfully established International Event Safety Conference (I-ESC) takes place. The speakers on Thursday and Friday deal with a broad spectrum of content concerning event technology and marketing. It includes everything from new technical standards in the audio and video area to the management of radio frequencies and new approaches to marketing and controlling. The previews will be maintained on a daily basis and the link Prolight + Sound 2016 will always show the growing number of featured companies in alphabetical order. In conjunction with Prolight + Soud PRG XL Video organized a special used equipment sale (UES) as pop-up store located a large warehouse in Frankfurt. We offer a large selection of high-quality event technology in the fields of lighting, audio equipment, video equipment, rigging, LED, cameras, etc. PRG XL Video has among other things moving lights, lighting consoles, audio consoles, daylight, speakers, microphones, video cameras, network technology, computer and trusses for sale. The equipment is provided "as is" sold without change option. Everything must go! NAB Show in Las Vegas will see the world premiere of two new 4K 50/60p slow-motion replay servers. Slomo.tv will show at their booth SL6321 the RED ARROW and BlackJack 4K - two new product family members that push the boundaries of slow-motion replay servers even further. With these new products the company once again sets new standards. RED ARROW offers 4 channels recording, 4 channels search and 2 channels playback with six 4K physical video ports – all in 4K 50/60p in a single 2RU enclosure. BlackJack 4K offers 3 recording, 3 search and 2 playback in 4K 50p/4K 60p in a single 4RU enclosure.